An informative resource for every archives, this brochure is available in print to help answer questions you or your users have about archives and manuscript collections that may be protected by copyright. The brochure is packaged in bundles of 25 and can be purchased via the SAA Bookstore. This text is intended to answer questions you may have about archives and manuscript collections that may be protected by copyright. Because copyright law is constantly evolving, this text is provided for introductory and educational purposes only. It is not intended to be a complete discussion of the subject and is not a substitute for qualified legal advice. Other countries have different rules; this document applies only to U.S. law. I want to use material from the archives. What do I need to know? Can the archives or manuscript repository give me permission to publish an unpublished work? 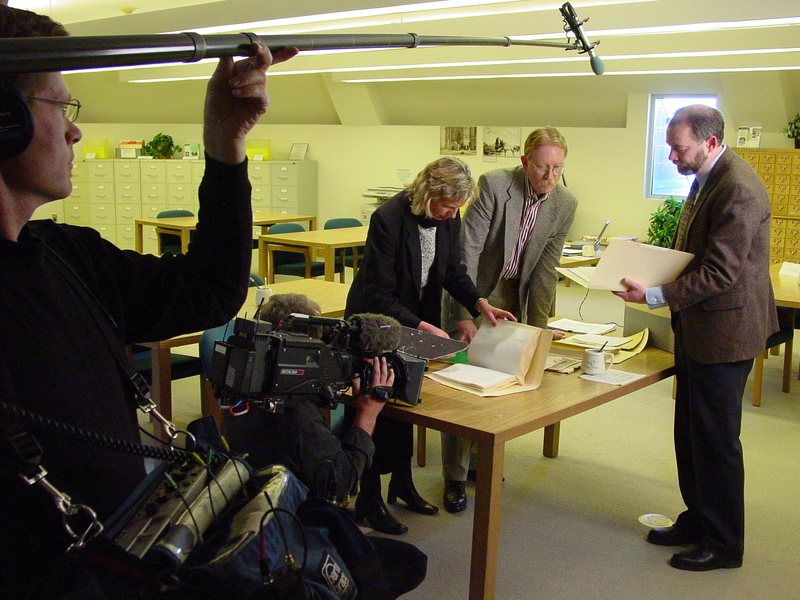 History Channel filming for “The True Story of Hidalgo,” (Left to right): Basha O’Reilly and CuChullaine O’Reilly from The Long Riders’ Guild and American Heritage Center Associate Director Rick Ewig, 2003. AHC Photofile # DSC02804.jpg. Courtesy of American Heritage Center, University of Wyoming. The fact that the archives or repository holds the physical document does not mean it also owns the copyright. Many donors or sellers, when they transfer collections, retain the creative rights to the material for which they are the rights holder. (Archives that serve as the repository of record for materials created by a parent organization will be able to communicate the organization’s procedures for managing copyright permission requests.) Only when rights holders assign the copyright in the work to a repository can the latter (and only it) give you permission to publish. But even when copyrights are transferred along with a collection, the repository may not receive copyright in all of the material, whether analog or born-digital. This is because rights holders can transfer only the copyrights they own, and in most cases donors will own copyright only in material they created. For example, donors would generally own copyright in photographs they took or in letters they wrote to others; however, they may not own (and therefore could not transfer) copyrights in photographs taken of them by someone else or letters they received written by others. The original rights holders may also have transferred copyright to a third party, such as a publisher, and thus no longer own the rights to works they originally made. Note that the repository that owns the item you wish to publish may charge fees for publication (even if it may not own copyright in the work) in addition to any fees a rights holder might charge. Any such stipulation is separate from copyright permission and is determined by a repository’s use policies. Why can you give me a copy of an unpublished work but not give me permission to publish it? Sections 107 and 108 of copyright law provide archives and libraries with a limited authority to make copies of copyrighted material without permission under certain conditions, such as when the copy is to be used for private study, scholarship, or research. Is there any way I can use an unpublished work without permission from the copyright holder? Determining that a use may be fair involves conducting an analysis along a continuum of “less likely fair” to “more likely fair.” Helpful aids in conducting such an analysis can be found at the resource page of the Society of American Archivists’ Intellectual Property Working Group. Could I be sued for using someone else’s work even though it seems a fair use? 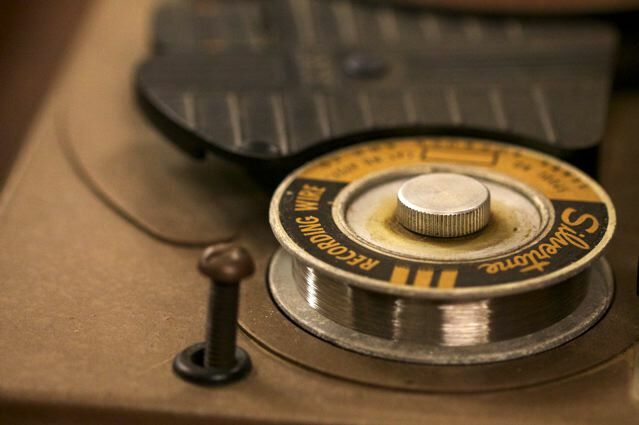 Wire spool on a magnetic wire recorder. Eric Harbeson. Courtesy of American Music Research Center, University of Colorado Boulder. This brochure was created by the Intellectual Property Working Group of the Society of American Archivists.